(Bloomberg) -- Make money first, save the planet second. Those are the reasons for most investors to get into green finance, according to HSBC Holdings Plc. Financial returns were cited as the biggest reason to have a strategy focused on the environment, social issues and governance, known as ESG, according to a survey of 868 institutional investors by the U.K.’s largest bank. Nearly three quarters of companies with this focus said that this was their number one driver, followed by tax incentives. Sustainable and responsible investing emerged after the 2008 financial crisis, as investors sought to avoid similar scenarios in the future. 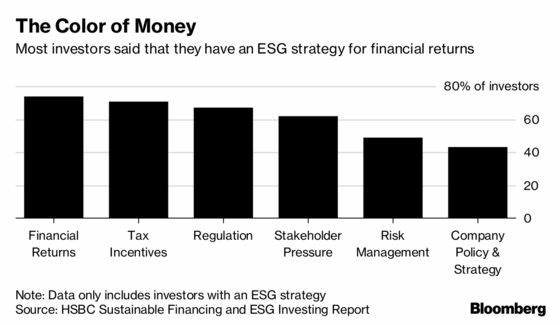 Asset managers with nearly $82 trillion under management, have signed on to the Principles of Responsible Investment, pledging to take ESG into consideration when deciding where to allocate their money. The Paris climate agreement from 2015 was ratified by nearly 200 countries and sent a signal to the global economy that decarbonization is firmly on the agenda. France was the first country to make it legally compulsory for institutional investors to disclose the carbon footprint of their portfolios. Some of the world’s largest pools of capital from insurers to university endowments have said that they’re no longer going to back oil, coal or gas. Until recently, it was unclear whether ESG meant sacrificing on performance. Investments at the other end of the spectrum such as oil and gas stocks have typically outperformed more volatile and immature renewable energy stocks. Green finance was thought of in a similar vein as impact investing, which prioritizes social change over returns. The HSBC report signals that this mentality is shifting. Central banks have repeatedly warned investors that climate risks are not priced in to asset values. Risks range from physical such as damages from rising frequency and intensity of natural disasters because of global warming to stranded assets, which is the risk that fossil fuel reserves to coal plants will lose value as governments get stricter on pollution. There is also rising evidence that green-tilting portfolios are outperforming benchmarks or at least matching them, according to Omi. Legal & General’s Future World equity index fund beat its benchmark in the first year. The fund has divested from oil companies including Rosneft Oil Co PJSC and Occidental Petroleum Corp., saying that they were too lax on environmental protection.